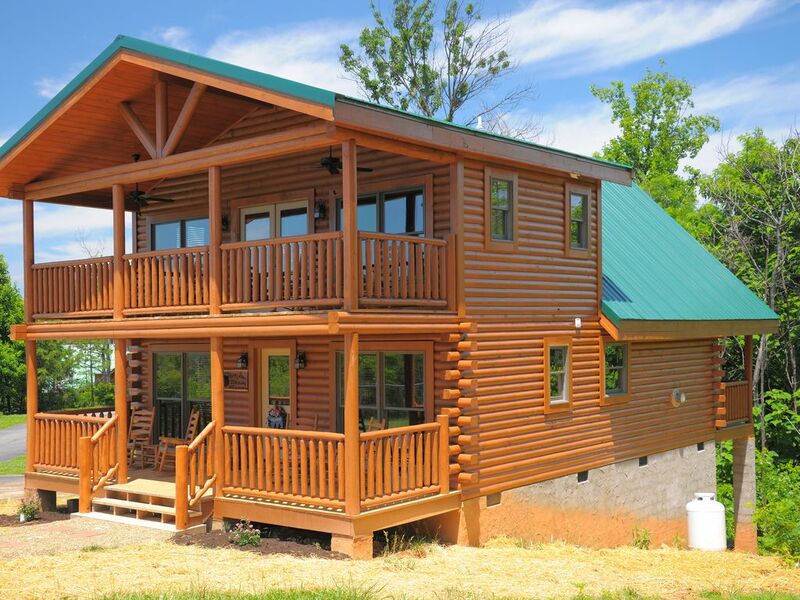 Brand New Cabin:Convenient to Everything the Smokies has to offer! Turn the key, leave your wearies at the door, and feel the stress slip away as you enter Honey Bear Hideaway. This is a brand new cabin full of all the amenities of home. The original was destroyed in the Wildfires in 2016. Enjoy the sights and sounds of the Great Smoky Mountains. Breathe in the fresh mountain air while sitting on the front porch rockers. Enjoy a panoramic view of the mountains as you start your day with a hot cup of coffee. Spend the evening soaking in the hot tub listening to the night sounds of the Smokies. Gaze off in the distance at Ober Ski Resort. This fully furnished, brand new construction, one bedroom log cabin comfortably accommodates up to four people. There is a king size bed in the loft bedroom, and sleeper sofa in the living room. Situated conveniently between Pigeon Forge/ Dollywood and Gatlinburg/ Great Smoky Mountains National Park, this cabin offers it all. Enjoy the lovely sights, sounds, and fresh mountain air while being just a short drive from all the shopping, food, and entertainment your heart desires. Spend an evening in by cooking in the fully equipped kitchen or on the outdoor grill. Catch up with the family on all the fun you had around the dining table that seats 4. Spend the evening relaxing with your family by the gas fireplace or challenge them to a game of pool! If you are looking for a relaxing vacation in the mountains, then look no further than Honey Bear Hideaway! We loved our stay at the cabin and we can’t wait to come back! This cabin was at top of the hill which gave us amazing views of ober even at night! The cabin itself was stunning, you can still smell the wood from the logs and we loved it!! Kitchen was beautiful and the living room was great for the kids with the big tv. Kids also had fun in the hottub! This place will be on my top 5 cabins to make a return visit to as location was great and nestled on top but also minutes between Gatlinburg and pidegon forge. Also manager Jodi was the best and most pleasant getting the directv fixed and checking to see if i needed anything else. Thinking about a cabin for family or just a couple dont pass this one up! Everything was perfect- the cabin and the view. We had a wonderful time! We loved the cabin - it was so much bigger than the photos looked, was very well maintained, super clean and really welcoming. Neighborhood was quiet, and the cabin had all amenities to make it feel like home. Would definitely stay again! Our cabin is convenient to Dollywood, Dixie Stampede, Parrot Mountain, Ripley's Aquarium, Great Smoky Mountains National Park, Blue Ridge Parkway, Pigeon Forge Community Center (racquetball, fitness center, bowling, game room, indoor pool, gym), live entertainment theaters, miniature golf, helicopter tours, outlet malls, zip line, children's activities, motorcycle rides, amusement parks, scenic drives, go-carts, seasonal events, Ober Gatlinburg, aerial tramway, ice skating, and the Arts and Crafts Community. Within 50 miles you will find some of the best motorcycle roads in the world: Dragon's Tail, Blue Ridge Parkway, Foothills Parkway, Smoky Mountain National Park, Cherahala Skyway, just to name a few.